Why Can’t Empty Leg Flights Go for Really, Really Cheap? | Stratos Jet Charters, Inc.
Why Can’t Empty Leg Flights Go for Really, Really Cheap? If empty leg flights were to go for the mere cost of fuel, the implications for passenger, owner and aircraft risks could be serious. 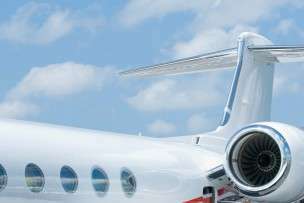 Next to ‘how much is a private jet,’ one of the most common questions we get asked is, ‘Why can’t empty leg flights go for really cheap?’ Like, really cheap, as in a few hundred dollars instead of a few thousand dollars. First, if you’re new to the term, empty legs (also known as ‘deadhead flights’ and ‘one-way charters)’ refers to flights that only go one leg of a round-trip mission because the charter plane needs to return to its home base or reposition elsewhere. To offset operating costs on the way home by filling the plane, air carriers offer steep discounts on one-way or empty leg flights. Empty legs are often priced about 25 to 75 per cent less, depending on factors such as the type of aircraft and the route. So, charter flights that might normally be $30,000, for example, could go for as low as $9,000. And if you divide that amount by a handful of passengers, you’re going to see some pretty significant savings if you don’t mind being flexible about last-minute travel, timing and the airport you land at. People who use private aviation regularly for business or pleasure understand the enormous savings, but sometimes people who are new to the private jet rental world wonder why empty legs flights can’t be priced at practically nothing…as in the cost of fuel or $500. 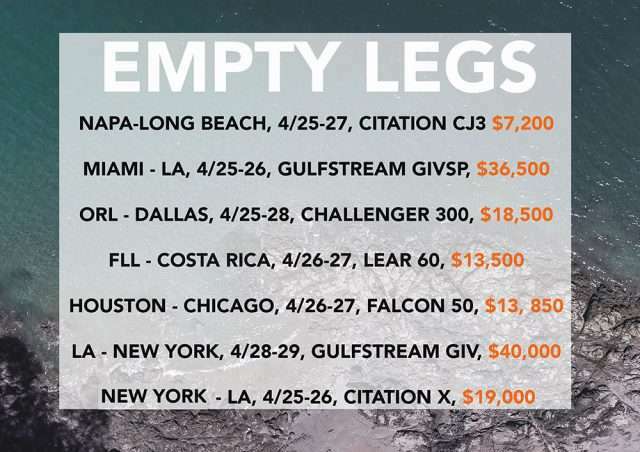 This is a sample of empty leg flights in a recent Stratos newsletter. Travellers see big savings over the cost of regular flights, but not at the risk of safety or a carrier’s loss. If the owner were to accept a low-ball offer such as $500…. 1. It increases the risk of damage or wear and tear to the plane, and the owner loses money. 2. It could put the client’s safety at risk. Brokers with the highest safety standards such as Stratos need empty legs to meet its safety parameters. As ARGUS-certified brokers with our own vendor approval program, all aircraft, crews and operators must meet strict standards. Sometimes brokerages with a priority on price over safety can offer empty legs at really cheap prices because they don’t need the flight to meet the same standards. 3. It would also set an unrealistic precedent that people could actually book flights for that price. Instead, operators price empty leg flights fairly so it’s an incentive to last-minute and/or budget-conscious travellers but they’re not losing money or putting passengers or the plane at risk. This way, it’s a win-win for everyone! Sometimes operators are also able to offer a bit of flexibility with departure times, so you can see big savings without having to go too far outside your intended itinerary, and, most of all, you know your broker has done everything possible to maximize your flight’s margin of safety! Are you looking to save big with empty legs, but want to help make sure your safety is a priority too? Stratos Jet Charters is obsessed with safety, and it shows. Reach out to one of our agents about your last-minute travel plans and we’ll make recommendations about one-way jet charter flights with great prices that won’t compromise your safety. 888-593-9066. Find out why safety in aviation is so much more than just a lack of accidents.